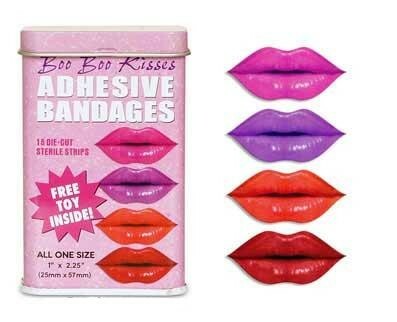 Kiss Shaped Bandaids | OhGizmo! There’s a new fashion to bandaids. First there was the bacon strips. They’re your usual everyday healing pads, in the shape of comely female lips. They come in a pack of 15, for all of $16. You could always pull a Nelly, and stick one on the side of your face (if you don’t know what I mean, just ignore me, the sleep trolls are getting to me). If your friends are retarded enough, they might actually believe it’s a kiss planted on your cheek by your voluptuous Wilma. Vi siete fatti male e vorreste un pÃ² di attenzioni? Magari un pÃ² di “baci”? Accontentatevi di questi cerotti. Un pacco da 15 per $16.